2013’s illegal rhino slaughter in South Africa was the biggest ever. The population of the critically endangered black rhinos is now near the tipping point with only just over 4,000 animals left in the wild. 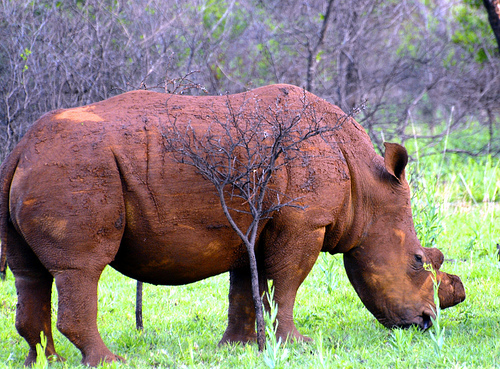 White rhino with horn removed to reduce value to poachers near Ohrigstad, Limpopo, South Africa. Photo: Paolo via Flickr.com. A record 1,004 rhinos were killed in 2013, an average of three animals every day, according to figures released by the South African Department of Environmental Affairs. Kruger National Park, home to South Africa’s largest population of black rhinos and white rhinos, was hardest hit, with poachers killing 606 rhinos within the famous safari destination last year. The 2013 figure represents a 50% increase on 2012, and more than double the number slaughtered in 2011. But the reason remained the same – huge profits are to be made from the illegal international trade in rhino horn.